A previous #ESJsurvey insight (No 5)  highlighted, on the basis of evidence from Cedefop European skills and jobs survey (ESJ survey), a number of significant challenges facing European skill systems. Some of these challenges include the fact that (1) EU citizens tend to have low awareness of the best match of their skills with labour market needs; (2) many of them have a sizeable stock of acquired, yet unrecognised, skills or feel that their skills are not effectively used at work and (3) labour market mobility tends to be biased against those most in need of it. To overcome these and other challenges, the skills agenda will seek to strengthen the range of EU education and training tools that were developed in recent years, such as the European qualifications framework (EQF), Europass, EQAVET, validation of non-formal and informal learning arrangements by EU Member States as well as the development of their skills anticipation infrastructures. All of these tools aim at strengthening EU Member States’ skill systems by facilitating the transparency of citizens’ qualifications and skills, identifying skill needs as well as fostering deeper integration between the worlds of education and of work. It is however a difficult task to evaluate the exact impact of these tools or initiatives on education or labour market outcomes, so EU policy-makers will have to step up their efforts at monitoring their progress in forthcoming years. Evidence of the extent to which European countries have developed or improved various skills-related policies tends to be based on qualitative expert inputs and is typically partial (Cedefop, 2015c). Crucially, it is challenging to decouple the independent influence of a policy lever on education or labour market outcomes given that they are not developed in a vacuum – many European tools for education and training have been developed in different contexts and time periods and have been implemented at different speeds. The tools affect a wide network of institutions (higher education, VET, adult learning) and seek to reach a plethora of actors (education and training providers, students, employers, workers, social partners, public employment service officials, policy-makers). Moreover, although the tools aim to improve the relationship between the worlds of education and the labour market, they are affected by the existing feedback loops between them and are shaped by a country’s socio-economic and historical context. Evaluation of the effectiveness of the EU education and training tools also requires consideration of a rich set of indicators, including, inter alia, the participation and mobility of learners in initial and continuing education and training; the extent to which the available stock of human resources is activated and participates in labour market activity or the degree of utilisation of the skills of the active workforce in well-matched employment. The effectiveness of policy levers critically depends on awareness of their existence and potential benefits by end users and ultimately acceptance of their social and labour market value. Results from the 2014 Eurobarometer survey on the European area of skills and qualifications made it apparent that European tools and initiatives on skills are not well known. For instance, only 9% of citizens in the EU28 area said that they know the level of the EQF to which their qualifications correspond and only 15% were aware of the Europass CV, the most widespread tool among all European instruments for documenting acquired knowledge, skills and competences. Some 6% of EU citizens have tried to work or study in another EU Member but were not able to do so. For 17% of those who tried unsuccessfully, the main difficulty encountered was a lack of information on whether their qualifications and skills would be recognised abroad; for 12% their qualifications were not accepted by their prospective employer. 2. Are we making the most of the EU’s education and training toolkit? Ultimately, the underlying potential and effectiveness of the variety of different instruments in place is dependent on exploitation of their synergies. For instance, the value of tools for skills validation procedures are maximised when they are complemented by the availability of intelligence on labour market needs and guidance (so that an individual’s recognised skills can be best matched with a suitable job) as well as updated qualification frameworks (so that individuals and employers can easily recognise a desirable learning pathway) – in essence forming a bundle of training and activation activities that can enhance the employability and mobility of individuals into well-matched jobs. Therefore, to assess the relevance and potential impact of various European skills policies and whether they serve the needs of European citizens, one must also consider if the available policy levers are implemented and utilised in synergetic fashion. Notes: The index is an additive mean of the frequency at which citizens in each country have simultaneously used/can use five skills-policy levers, as identified in the survey and described in the main text. The index ranges between 0-5; a value of 0 implies that individuals have not used/do not think they can use any of the five policy levers; 5 = individuals have used all policy levers. Mean EU28 index value: 2.6 (s.d. = 1.4). Source: Special Eurobarometer 417 microdata European Commission (2014); Cedefop’s analysis. Although the above-mentioned pillars do not constitute a comprehensive set of existing national and European tools in force, they do capture a relatively broad spectrum of the prevailing initiatives related to skills policies. Moreover, it is expected that the index will be positively correlated with other relevant policy levers on education and training policy (e.g. the development of NQFs, the setting up of a quality assurance national reference point etc.). 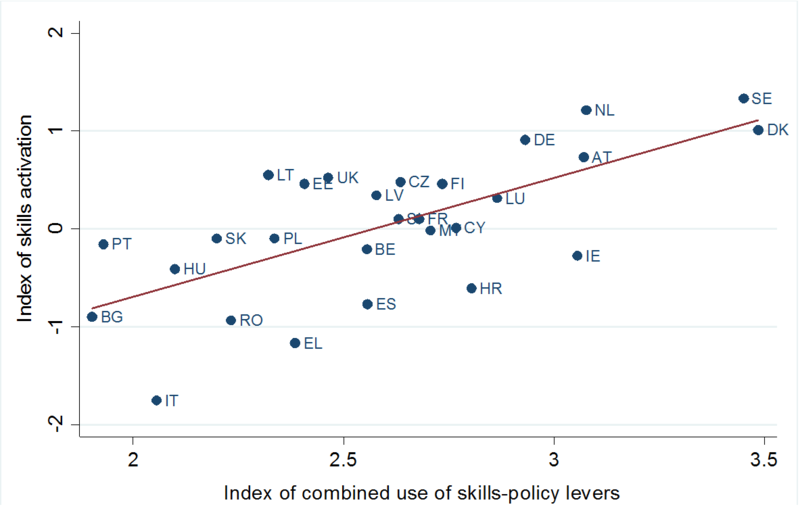 For instance, the existing data confirms that there is a positive and statistically significant correlation (Pearson correlation = 0.24) between the derived index of combined use of skills-policy levers at national level and the share of citizens who can map their own qualification to the level of the EQF. This provides some confirmation that EU citizens who live in countries with stronger national skills recognition policies are also more likely to be aware of European tools that aim to promote mobility across the single market. 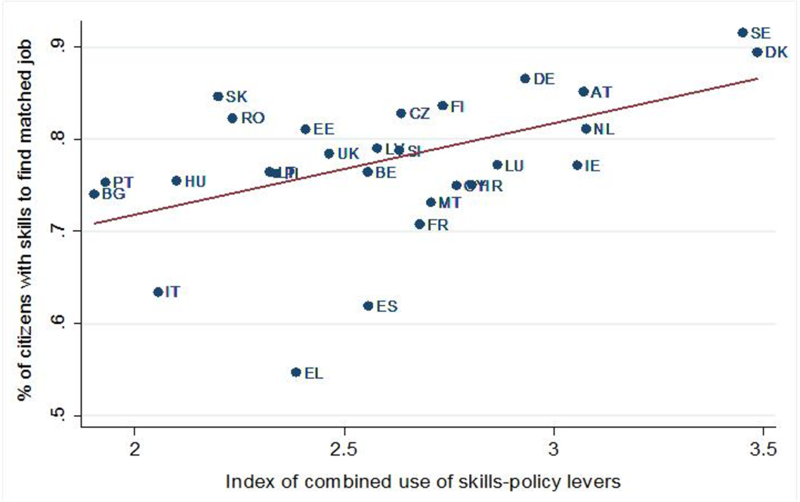 The index in Figure 1 highlights that citizens in Denmark, Sweden, the Netherlands, Austria and Ireland are more likely to be aware of or to have simultaneously used an average of more than three (out of five) skills-policy levers relevant to recognition, validation, guidance and skill intelligence. By contrast, citizens in Bulgaria, Portugal, Italy and Hungary, are the least likely to think that they can benefit/have benefitted from the synergies allowed for by the arsenal of skills-related policy instruments. 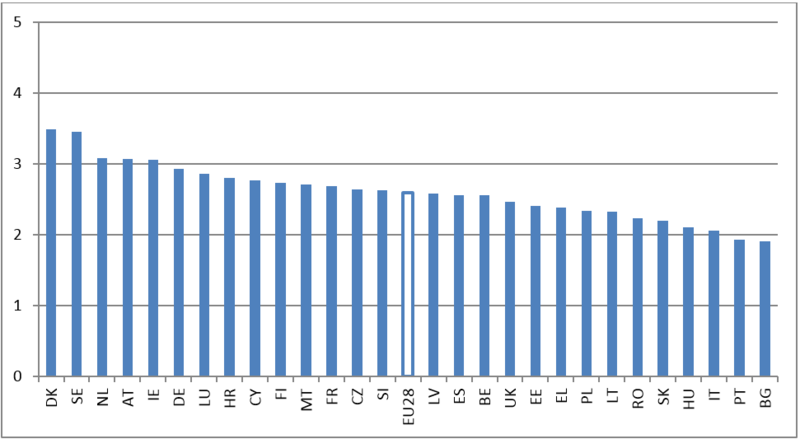 Analysis of the Eurobarometer microdata further reveals that citizens who jointly utilise a wider range of skills-policy levers (presumably because their own national context encourages awareness and use of them) are more likely to agree that they have the necessary skills to find a job in line with their qualifications (Figure 2). There is a positive complementarity between, on the one hand, the degree to which the education and training policy infrastructure in a country promotes transparency and better orientation of individuals’ skills and, on the other hand, their responsiveness to the skill needs of labour markets. Despite not demonstrating causality, the figure does highlight that there exists a close relation between the synergetic use of skills validation and guidance instruments and skills matching in EU countries. Note: Vertical axis = share of respondents who replied positively to the question: do you agree or disagree that your education and training has provided you with the necessary skills to find a job in line with your qualifications? It is also found (Figure 3) that there is a significantly high correlation, in the order of 0.67, between the synergy of policy-levers index and another summary measure of the extent to which EU countries activate their working age populations i.e. an index that combines information on the share of early leavers from education and training, proportion of NEETs, employment rate of recent graduates and activity rates of varying age groups . Countries with education and training systems that offer wider access to various skill policy instruments, which promote transparency and better guidance of skills for their citizens, are also found to be more likely to perform well in terms of their overall capacity to activate their human capital stock. EU Member States that have invested the most in strengthening their policy framework on skills validation, recognition of qualifications and career guidance have stood to gain the most in terms of higher labour market activation levels and skills matching. But what the analysis in this #ESJsurvey insight confirms is that simply adopting and developing various skills initiatives in isolation is inefficient whereas facilitating their synergetic use may lead to desirable outcomes. To avoid undermining the efficacy of the potential of the EU’s education and training tools, Member States must facilitate the broader take up of the relevant instruments by their citizens – for example by making them user-friendly and transparent. The new Skills agenda for Europe suggests policy actions and initiatives that will seek to accomplish exactly that . Note: Vertical axis = composite indicator of skills activation based on several individual indicators, as described in the main text. Discover more ESJ survey indicators and analysis at Skills Panorama. Cedefop (2015a), Skills, qualifications and jobs in the EU: the making of a perfect match?, Cedefop reference series. See http://www.cedefop.europa.eu/en/publications-and-resources/publications/8088 for first insights. Please cite this short analytical piece as: Cedefop (2016), ‘Policy tools for a new #EUSkillsAgenda: a tale of synergy or isolation?’, #ESJsurvey Insights, No 6, Thessaloniki, Greece. Cedefop (2016), ‘Policy tools for a New skills agenda: What are the key challenges?’, #ESJsurvey Insights, No 5, Thessaloniki: Greece. The data generally show a weak correlation (Pearson correlation coefficient = 0.13) between the availability of career guidance services in schools or after completing education and training and the actual use of such services by citizens. For this reason, the index constructed has focused on those citizens who declared that they have actually used career guidance services, which is, by definition, dependent on their accessibility. Unfortunately the survey did not include an option inquiring whether individuals have looked for information about (historical or anticipated) labour market trends and other contextual labour market variables (e.g. wage levels, usual hours of work etc. ).